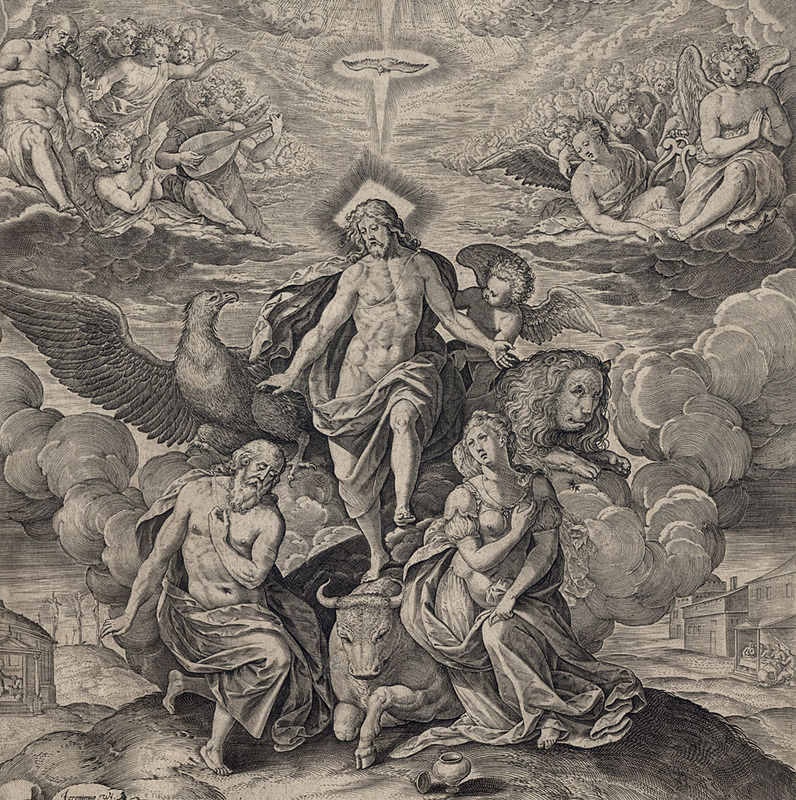 Note: some authorities propose that the publisher is Hans Liefrinck I (1518?–73) but this is not possible mindful that Lierinck (the elder) had already passed away before this print was executed. 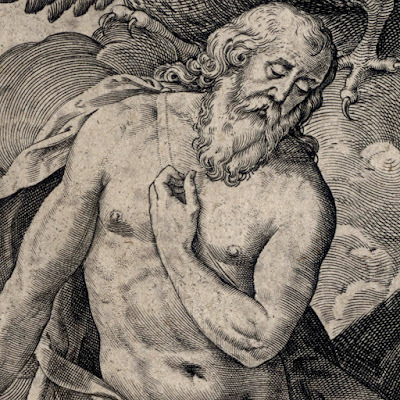 According to the BM there is another Hans Liefrinck “who was the son of Cornelis Liefrinck and worked in Leiden” but again the date that he died, 1599, confirms that he could not be the publisher either and this leads me to attribute Hans Liefrinck II as the publisher. 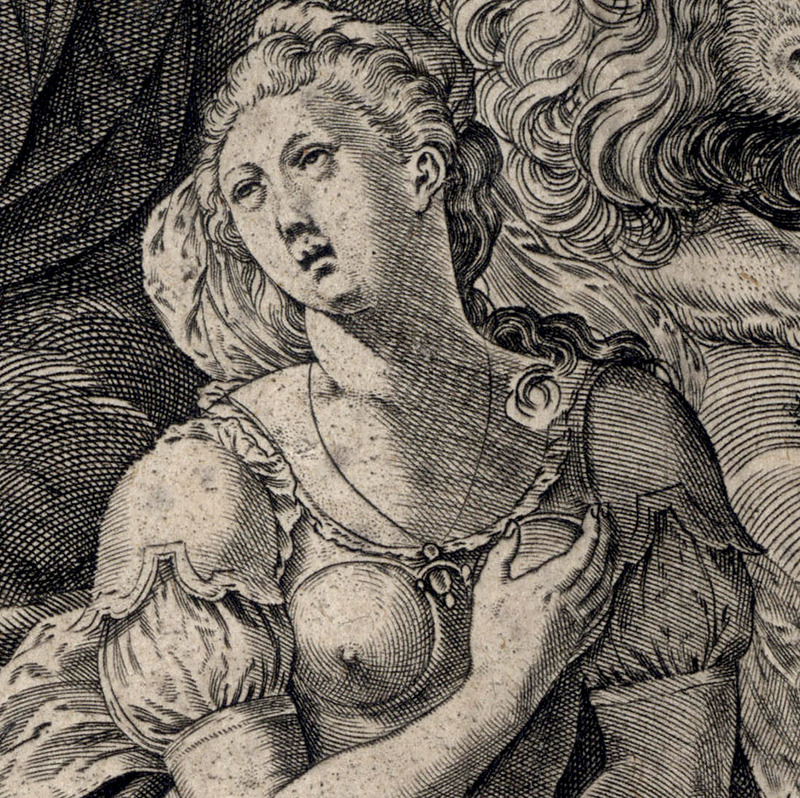 Engraving on laid paper trimmed to the image borderline and slightly within the borderline on the left side. Inscribed below the image borderline in two columns of three lines: “[E]n Deus ad veniam pronus … // … in imagine serunt.”; with publication details at centre between the two columns: “Johannes / Lifrinck / Excud”. Condition: crisp impression trimmed along the borderline and within it on the left side and lined upon a support sheet of laid paper. The sheet is slightly age-toned with light restoration of small areas of minor abrasion and there is a closed tear (approximately 1 cm) on the lower edge towards the right. 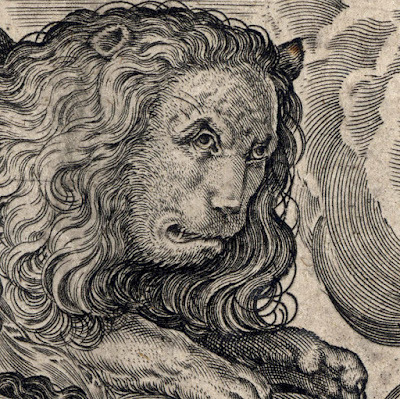 I am selling this of magnificently rendered large engraving that is so rare that it is not in the collection of the British Museum, the Rijksmuseum or the Metropolitan Museum of Art and executed by one of the major printmakers of the Renaissance era for the total cost of AU$468 (currently US$371.78/EUR311.63/GBP288.50 at the time of this listing) including postage and handling to anywhere in the world. If you are interested in purchasing this very beautiful print—mindful that prints of this rarity are virtually never seen on the market place—please contact me (oz_jim@printsandprinciples.com) and I will send you a PayPal invoice to make the payment easy. While I was closely examining this spectacular engraving—one that is so rare that none of the major museums (viz. The British Museum, the Rijksmuseum and The Metropolitan Museum of Art) appear to possess a copy—I found myself becoming more and more involved in trying to decipher the symbolic meanings of the print. 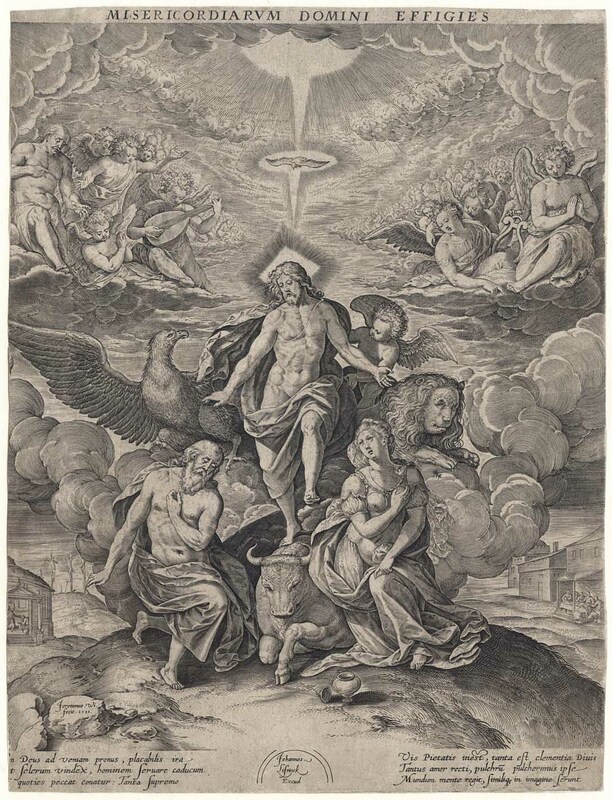 For example, my brain was slow to realise that the cow that Christ stands upon was not a reference to his birth in a manger—a cow’s feeding trough. 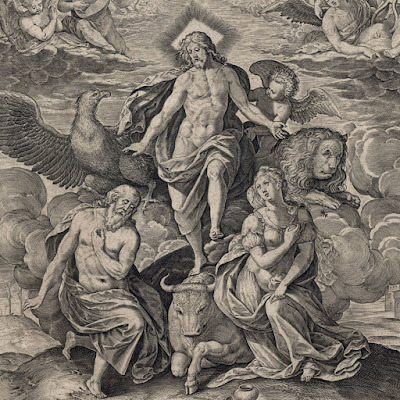 Instead the cow is a symbolic attribute of Saint Luke, but this realisation only occurred once I had pieced together the idea that the combination of the three animals surrounding Christ (viz. 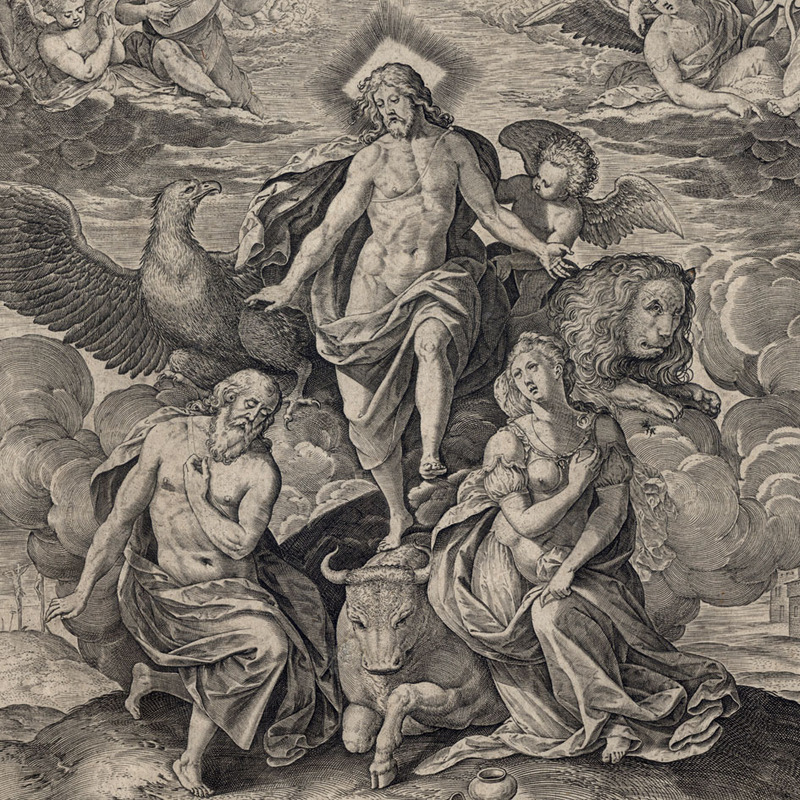 cow, lion and eagle) and the angel on his left were actually the symbolic attributes of the four evangelists: Mathew, Mark, Luke and John. Moreover that my initial quandary over the awkwardness of the Christ shown raising his left foot rather than his right one—a pose that right-handers like myself find very unnerving to look at—was nothing at all about physical movement but rather about spiritual transcendence to a heavenly realm filled with adoring fat folk. 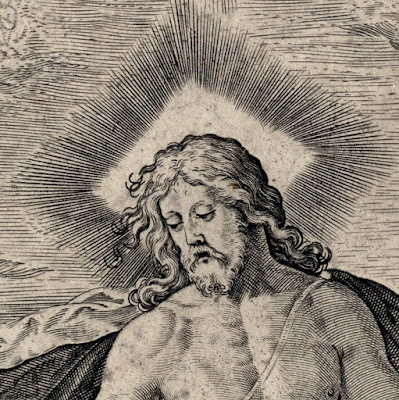 To be honest, however, I had to do a quick Google to find the significance of Christ shown with a square halo rather than a round one. The reason is surprisingly simple: the square halo symbolises that Christ is still in the temporal world and the shape of the halo will change to a round one once he transcends the world of the mortals. 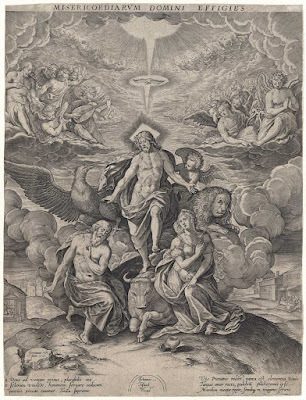 Regarding this notion of spiritual transcendence, note how Christ’s arms are arranged to suggest an arrowhead and how the leaning pose of St John and the Virgin extend the angle of this arrowhead pointed to heaven.